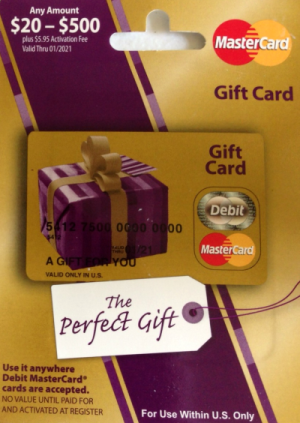 Visa gift cards are available to purchase online at giftcards.com. The highest denomination is $500, and a purchase fee is $6.95. (It used to be $4.95. It’s increased recently.) And they also charge a shipping fee. There are several options for shipping, and I will show the details later. Update 11/18/2015, Giftcards.com removed $500 VGCs from the option about a month ago. The highest denomination of VGCs is now $250 with $4.95 activation fee. Update 11/27/2015, Giftcards.com put back $500 VGCs! A purchase fee is the same, $6.95. I don’t know the exact date they were back. First of all, I’ll show the details of the gift card itself. The card is issued by the Bancorp Bank. It’s the same bank as Vanilla brand gift cards, but the cards from giftcards.com are NOT Vanilla. You can use them at Walmart. So far, I have been using them for only reloading Amex Serve, and they were accepted at Walmart kiosk, Money Center, and Family Dollar. Your name, expiration date, and card# are embossed. On the top right corner, there is a small print “Gift”.But it’s so tiny that you can remove it by a knife, sand paper, or conceal it by a sticker. The card needs an activation at giftcards.com or over the phone. You will see or be told a pre-set PIN at that time, and you can change it to your own PIN later. Unlike VGC from Staples, there is no way to register your name and address. I think it’s already registered because my name is on the card and accepted at Walmart. So, I don’t really care. The minimum cost per card is $6.95 (purchase fee)+ $1.99 (USPS first class mail) = $8.94. Before they raised a purchase fee, there was always a promo code to waive a shipping fee (UPSP first class mail only), but I can’t find the code anymore. I think they stop offering free shipping codes. All I can see now are codes for free personalization or free greeting card. For your information, you can check current promo codes on the activation page of the website. Activate (Enter a card number of) any VGC from giftcards.com (it doesn’t matter if the card has been activated) and it shows one promo code. Refresh the page to have it changed to a different code. I used to do this until a free-shipping code showed up, but now it never shows up. From this experience, you should avoid $1.99-USPS First Class. Order 4 or more cards at a time and choose $7.45-USPS Delivery Confirmation. If you order four cards, the shipping cost is $1.86 per card. And a purchase fee is 6.95. The total fee is $8.81 per card. It’s expensive for $500 VGC, but “G-Money” will reduce the most of it. You can earn G-Money Points on every order at giftcards.com. Earn 1 point on every $1 spent. 1 point is worth 1 cent, and you can redeem for future purchases. That is to say, it’s 1% back loyalty rewards program. The points are redeemable at giftcards.com only. However, since you can redeem for VGC purchases, you can consider them as cash. And, a purchase fee and shipping fee are also eligible for the reward points. For example, when you bought four $500 VGCs with $7.45 USPS Delivery Confirmation, you pay $2035.25 and earn 2035 points. When you repeat this transaction, you earn and redeem around $20-worth of GMoney on every order. ($2035.25-20)/4=503.8125. The fee will be less than 1%! Update 11/18/2015, A purchase fee, Shipping fee, and G-Money redemption are no longer eligible for G-Money. If you buy $250 VGC, you earn 250pts=$2.50. When you redeem this points on the next $250 VGC purchase, you will earn 247 or 248 pts. Here is the calculation of $250 VGCs version when you buy eight VGCs. A total cost will be $254.95*8+$7.45=$2047.05. You will earn $20-worth G-Money on the first order, but if you keep using G-Money for the following orders, you will earn a little less than $20 G-Money. But, let’s make it simple, say you earn $20 G-Money every order, you pay $2027.05. $2027.05/8=253.4375. As you see, the fee is now more than 1%. Update 11/27/2015, I also found that there is 1% cash back deal from some shopping portals, Simply Best Coupons, ShopAtHome, and Panda Cash Back. I just checked out four cards via SBC’s link. However, it seems you can’t earn G-Money on VGC purchases, instead. And, there is a promo code for free shipping. It’s valid for USPS First Class mail only. So, I don’t recommend using it. Card#, expiration date, and your name are embossed on VGCs. The highest denomination is $500 with $6.95 fee. The cheapest shipping cost is $1.99-USPS First Class Mail. There used to be promo codes to waive this fee. It may be available sometimes in the future, but I wouldn’t use it. $1.99-USPS First Class Mail isn’t reliable. You’d better choose $7.45-USPS Delivery Confirmation. Giftcards.com offers their own rewards program. It gives you back 1% of every dollar you spend at giftcards.com. And most importantly, VGCs from giftcards.com are WM, TGT, and FD friendly. I received Amex Serve card yesterday and tried to do something, but there has been no good progress at all. First, I tried to load with $400VGC at Family Dollar, which I bought at Target.com. The gift card has the same feature as Vanilla VGCs. So, you can’t use it at Walmart for reloads. I visited only one store today. The store used to accept debit cards for reloads, but now they accept cash only. There are three stores I loaded with VGCs last year. I will see if they still accept debit cards for reloads. During a recent review of your American Express Serve® Account we noticed you have linked a prepaid card that is not a permitted funding source. The acceptable card funding sources are a bank debit or credit card. Please contact a Customer Care Professional immediately at 1-800-555-4318 so we can discuss further details on this matter. “we noticed you have linked a prepaid card that is…..” This isn’t correct. PP debit card is not a prepaid card. I used the card for Serve’s online reloads last year. I’ve been using it for Redbird online-reloads until I closed my account this month. Do they confuse it with PP Prepaid MasterCard? Or they only accept debit cards issued by major banks now? I have two reward-earning debit cards. One is PP debit card, and the other one is Discover Cashback Checking Debit card. Discover debit card can earn 10 cents per transaction, up to 100 transactions per month. If you want to earn maximum rewards with this debit card, you have to make (100) $10-online-reloads every month. It would be obviously an abuse against both Discover and Serve. So, the only choice for me is to use PP debit card. I will call Amex tomorrow to see if it was a mistake or a new rule. And I also need to go to Walmart and other Family Dollar stores tomorrow. While I was waiting for Serve card, there are many prepaid cards piled up. I hope ATM works good and find FD store that still accepts debit cards for reloads. I received an email today. It is from American Express Serve. Beginning February 1, 2015, MoneyPak® will no longer be available for purchase. Beginning April 1, 2015, Vanilla® Reload PIN will no longer be available to purchase. However, you can still easily add cash* to your Serve® Account directly at the register using Vanilla® Reload Swipe Load. You can still add money to your account in many other convenient ways including Direct Deposit and free cash reloads at the register at 27,000 CVS/pharmacy®, Family Dollar®, Walmart® and participating 7-ELEVEN® locations. Click here to learn more. You can review this change in the Consumer User Agreement here. MoneyPak and Vanilla Reload PIN are reload packs. You purchase and add money to them at stores. And then you can reload your prepaid cards online. These products have existed for a long time, and they are also well-known that they are used for frauds and scams by crooks, especially MoneyPak. I believe they will stop selling their products due to such activities by crooks, not manufactured spending. These changes won’t be any impact on me because I simply don’t buy them. Since they charge lower fees than Visa/MasterCard/AmEx GCs do, they are better items for MS. But I just can’t find stores that allow to use credit cards for purchases. Besides, I will close Serve account in a few days in order to register Redbird. And the point is that whether stores will allow to use debit cards for reloads or not. I have visited 8 Family Dollar stores in my neighborhood and tried to use Visa GCs for reloading Serve. Half of them allowed, and the other half refused and said “Cash Only.” From this example, when other stores start using VR Swipe Load, you will need to make sure if your local stores allow to swipe not only cards to be loaded, but also cards to pay. However, I don’t really care now. Again, I will close Serve and open Redbird soon. Redbird can be reloaded only at Target stores. My last transaction of Serve (withdrawing the remaining balance to my bank account) was completed. But I don’t see the same transaction in my bank account yet. Just in case, I will wait until this transaction shows up in my bank account. Does Target Visa GC come with Free $5 Target GC? 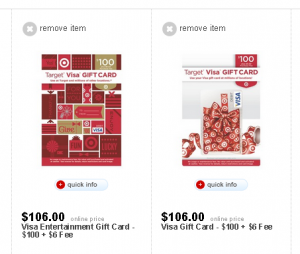 There is new Target Visa Gift Card available online. I have seen one many times at Target stores, but there had never been ones online. Denominations and fees are the same as existing ones. At first, I thought it is just a different design. But, it seems that new ones may have great bonus. I clicked “Visa Entertainment Gift Card – $100 + $6 Fee” and scrolled down to see details of the card, and soon a short description attracted full of my attention. Does the package have $5 Target GC? They also sell $25 and $50, but there are no description of Target GC in their pages. I also noticed that there is no the following warning message in the pages of new ones. Does it mean I can pay with Target GCs? Today, I bought three of $100 Visa Entertainment Gift Cards though ShopDiscover link. I used to buy a lot of Target Visa GCs (existing version) until Walmart stopped accepting these GCs (along with Vanilla and OneVanilla) for reloading BlueBird and Serve. ShopDiscover paid 5% cash back on all those orders. I hope this deal is still alive. 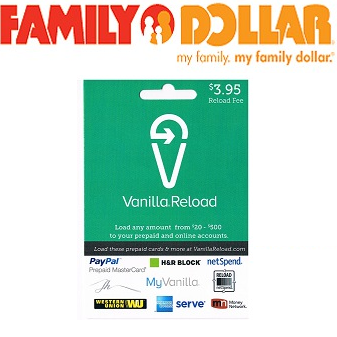 The reason I buy Target Visa GCs now is that Family Dollar recently started a service for reloading Serve card. And they accept Vanilla, OneVanilla, and Target Visa GCs for reloading Serve.